Once the animatronic entertainment at Showbiz Pizza, The Rock-afire Explosion faded into obscurity in the late 1980s. In this funny and touching documentary, Houston filmmakers Brett Whitcomb and Bradford Thomason explore the cult following that's keeping these robot rockers alive today. 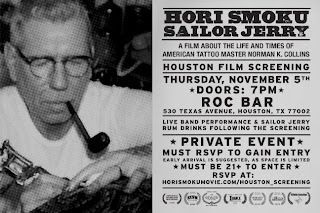 Hori Smoku Sailor Jerry is a feature length documentary exploring the roots of American tattooing through the life of its most iconoclastic figure, Norman "Sailor Jerry" Collins. Considered by many the foremost tattoo artist of all time, Collins is the father of modern day tattooing, whose uncompromising lifestyle and larger than life persona made him an American legend. Through rare interviews, photographs and hours of archival footage, Hori Smoku Sailor Jerry: The Life and Times of Norman Keith Collins, explores the past, present and future of the global tattooing phenomenon. Why: Premier Houston Film Screening, Complimentary Sailor Jerry Rum drinks, surprise band performance.